Bromley Curtains and Blinds » The latest curtain fit – Vintage Sanderson and lampshades – Shortlands, Bromley. Having done Many, Many fifty shades of grey schemes in the last eighteen months, the last two schemes at Bromley Curtains and Blinds have been from the Sanderson Vintage 2 collection. The latest job was completed in Shortlands, a suburb of Bromley just last night. Full length curtains, lined and interlined with a softly upholstered pelmet. The job went smoothly thanks to the excellent job done by our expert curtain fitter. Not only was the pelmet beautifully made it was skilfully fitted around the bay window and up to the fitted wardrobes. 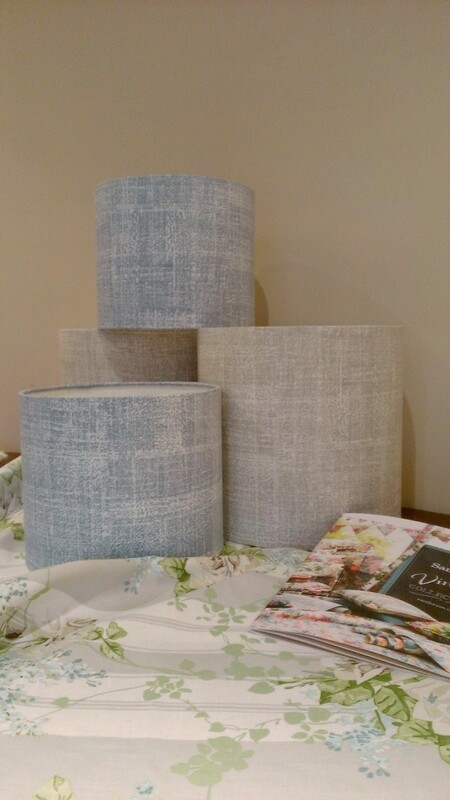 The curtains looked amazing, the finishing touches , beautiful co-ordinating bespoke lampshades in Sanderson Washi fabric in mineral blue and yes GREY! Bespoke lampshades, for ceiling pendent and table lamps.